The super rich can pretty much buy whatever they want. Homes in multiple cities, states, countries, and continents. Insanely expensive cars that cost more than many people's houses and condos. Private planes with interiors that rival the most luxurious hotel suites. 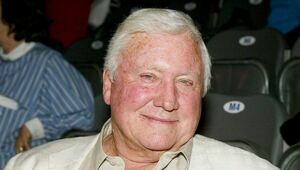 Heck, if they really wanted to, and some do, they can buy their own islands (Sir Richard Branson, I'm looking at you). But you really aren't a true billionaire until you've commissioned your very own, very huge, very expensive mega yachts. A yacht that features all the comforts of home and more. Like a helicopter pad and submarines. These yachts are so lavish, so well equipped, and so expensive that those sailing on them want for nothing. Sure, they can't create peanut M&Ms in the middle of the Indian Ocean if they are all out on the ship, but pretty much anything you want is at your fingertips. And trust me, as soon as the ship is within range, if you really want those peanut M&Ms the helicopter or speed boat attached to the mega yacht can be dispatched to fetch them in no time. More than anything else, the mega yacht is a symbol of power and wealth. It is an ocean faring Ferrari. It is a floating display of the size of your manhood… I mean bank account. Let's take a look at the Top 10 most expensive yachts. They are truly amazing. Steven Spielberg's mega yacht was constructed by the Dutch shipyard Oceano. It was constructed to his specifications and tastes. It has an infinity pool with a 15 foot glass surface that can be used as a movie screen. It has its own fully equipped gym, helipad, and private deck for Spielberg. It can house 12 guests and has a crew of 26 to run the ship and attend to the guests. Nasser Al-Rashid, a Saudi multi-billionaire, owns this yacht. 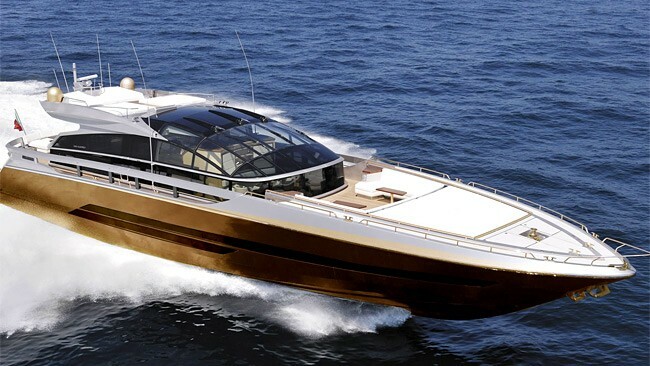 The name of the yacht is applied to the ship in 24-karat gold. Not much is known about this mega yacht, but you can imagine the opulence, luxury, comfort, and amenities inside of it. This yacht is owned by the Prime Minister of Qatar, Hamad bin Jassim bin Jaber Al Thani. It was designed by Tim Heywood and constructed by Peters Schiffbau Wewelsfleth yard. The yacht has 10 suites, which can hold a maximum of 24 guests. There are two VIP rooms created for the yacht's owner. Al Mirqab has its own movie theatre, sun deck, pool, and helipad. Alisher Usmanov, a Russian businessman owns this yacht that was constructed in 2008. The yacht is named after his mother and was also designed by Tim Heywood. 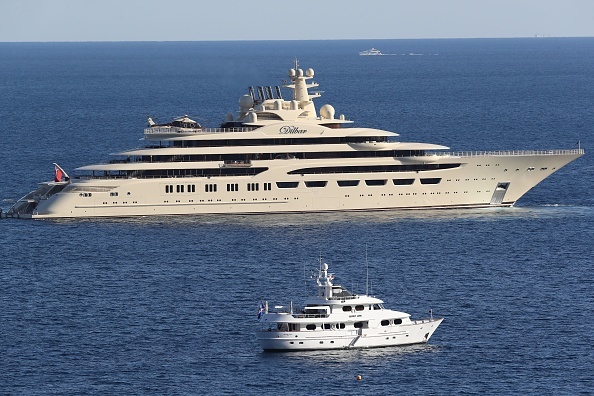 Dilbar can accommodate 20 guests with a crew of 47. This yacht has an aluminum superstructure and was named after its owner, Sultan Qaboos Bin Said Al Said of Oman. While it was being constructed in 2007 and 2008 it was the world's second largest yacht. It can accommodate up to 70 guests with a crew of 154. Andrei Melnichenko, is a Russian billionaire with this gorgeous yacht of unique design. This yacht was built by Philppe Starck and garnered quite a bit of discussion while it was being built. It is relatively small by the standards of this list with a 14 guest, 43 crew/staff limit. This yacht has quite a story attached to it. Originally commissioned by the Prince of Brunei, Jefri Bolkiah in 1996, its construction was stopped due to the Prince's lack of funds. Five years later in 2001, Shiek Mohammd bin Rashid Al Maktoum, Prime Minister of the UAE, took the project over. The 525 yacht has the mega yacht prerequisites of a helipad, swimming pool, and spa. It has been called a floating city because it contains nearly anything a person could want or need. It is quite a financial jump from the 3rd most expensive yacht to the 2nd (and also from the 2nd to the 1st). This 528 foot yacht has a crew of 70, 24 guest rooms, two helipads and a mini submarine. Yes, I said submarine. Fancy, hitting the bar, getting sloshed and taking a submarine out for a spin in the middle of the ocean? You can on the Eclipse. This yacht has been anchored just off Marina Del Rey in Los Angeles for the past month or so (September 2013). It belongs to Russian billionaire Roman Abromovich. The most distinctive feature of this second most expensive private yacht is its well-designed defense technology. It has its own intruder detecting system. It can detect cameras and has an anti-paparazzi laser shield that scans and blocks nearby prying camera lenses. This yacht was constructed in Hamburg, Germany. This yacht cost $4.8 billion. Just let that sink in for a moment. Owned by an anonymous Malaysian businessman, this yacht gives new meaning to excess. The yacht is decorated with bones of dinosaurs and tiny meteorites. 100,000kg of gold and platinum as well as precious stones are used around the yacht, as apparently that is her owner's idea of elegance. The History Supreme was built by UK based Start Hughes and Company and took over three years to complete. ***UPDATE*** We fell for it, turns out that the #1 Yacht was an internet prank. We are actually amused and relieved. The idea that someone would spend $4.8 billion on a diamond and gold encrusted yacht with dinosaur bones for decorations was… well, we should have known this was a fake, but we aren't alone in falling for it. It's a relief that there isn't an anonymous Malaysian businessman out there with such tacky taste and more money than sense. In fact, the richest Malaysian man, Robert Kuok, who is worth $12.5 billion razed his mansion to avoid a showy display of wealth, quite the opposite of the ostentatious mythical yacht.